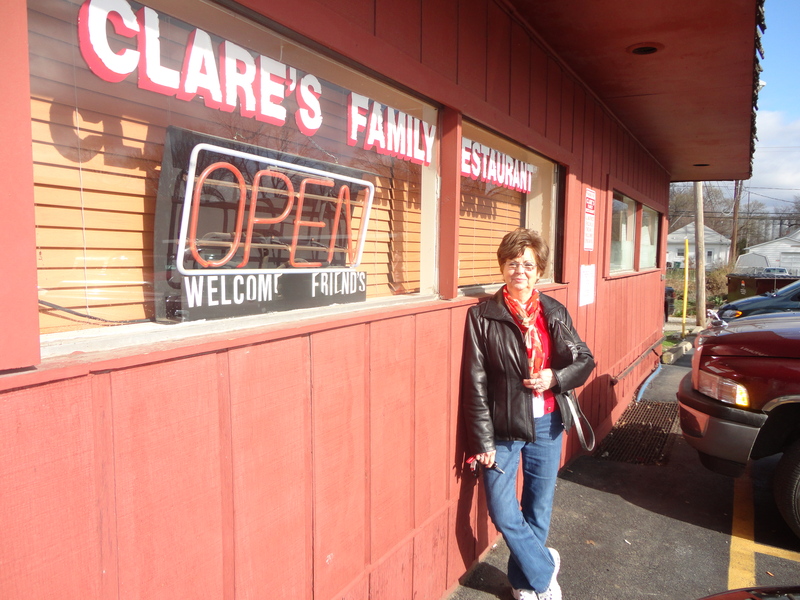 My mom, Lora Disque pictured in front of Clare’s restaurant wanted to go to Decatur for an event. The event was a bust so we decided to go to breakfast. Whipping out the ever ready Garmen we came up with Clare’s Family Restaurant. The parking lot was so crowded you could hardly find a place. After going once around the block we decided that the nondescript outside must not be an indication of the food inside. Glad we stopped, great find! We squeezed into a booth in a filled restaurant about as big as a football field and the hostess told us it was busy, but not as busy as some Saturday mornings. If there were more people inside there would not have been any seats. Established in 1997 they bake their own home made bread I tried out the home made toast, amazing. I ate the cowboy breakfast an egg scramble with bacon and other great ingredients. Although there was a bit of a wait, the food was as my grandson says, “dewishous”.